As many of you may be aware our club will celebrate its 90th Anniversary next year .Our club was proposed and accepted as a member of the Leinster Branch IRFU and IRFU on 15th Seprember 1926 . ( you can get more information on the club’s history on the club website ).It is our intention to celebrate this achievement with a series of events during next year .We are looking for suggestions/ideas from everyone and how you think we should celebrate this major anniversary .It is our intention then to set up a small project group to organise and run whatever events you feel are most appropriate .All suggestions are welcome and we ask that all suggestions are mailed by to the club email skerriesrugby@eircom.net by 15th January 2016 .We value your input to ensure that everyone’s views are discussed and actioned .This is your club so please let us know your thoughts. 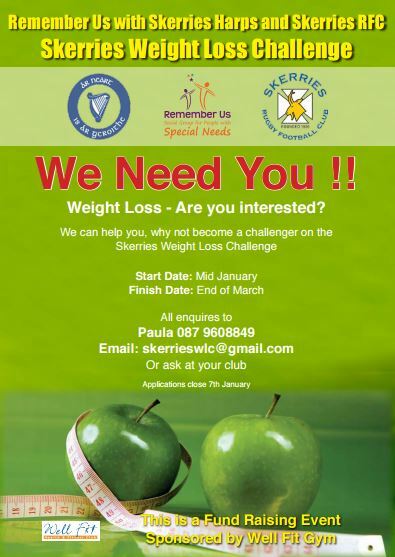 Skerries Rugby Club are participating in the Weight Loss Challenge again in 2016 .We need 10 challengers to represent the club ( participants do not have to be members of the club ) The community partner is Remember Us , a social group for people with special needs .The challenge is run over 10 weeks , starting mid/late January and coincides with Operation Transformation on RTE ,If you are interested in participating and helping both the club and Remember Us please let us know be emailing the club on skerriesrugby@eircom.net by 20th December 2015 .Many thanks for your support . We want to confirm that the club office is open from 10 to 11 every Mon /Wed and Friday and out of office hours, there is an answering machine to take messages. Club phone number is 01-8490066 or alternatively you can contact the club by email at skerriesrugby@eircom.net.